Over the past 10,000 years human cultures have expanded from small groups of hunter-gatherers to colossal and complexly organized societies. The secrets to how and why this major cultural transition occurred have largely remained elusive. In an article published on July 24 by Russell Gray and Joseph Watts in PNAS they outline how advances in computational methods and large cross-cultural datasets are beginning to reveal the broad patterns and processes underlying our cultural histories. 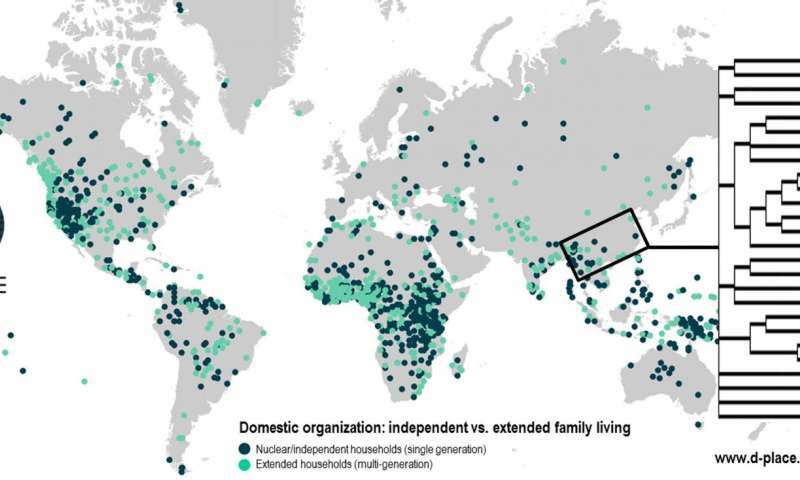 Ten thousand years ago most humans lived in small, kin based, relatively egalitarian groups. Today we live in colossal nation states with distantly related members, complex hierarchical organization, and huge social inequality. This change in size and structure of human social organization over this time represents a major transition in human's evolutionary history, one that we still know remarkably little about. To date, most research on cultural evolution focuses on microevolution; changes that occur within cultural groups over relatively short periods of time. However, as Russell Gray, Director of the Department of Linguistic and Cultural Evolution at MPI-SHH points out "processes observed at the micro level do not necessarily explain the macroevolutionary patterns and major transitions we observed in deeper human history." In a new article by Russell Gray and Joseph Watts in Proceedings of the National Academy of Sciences (PNAS) present a "plea" for research on cultural macroevolution. The authors highlight the exciting potential to combined cutting edge statistical methods and comprehensive cross-cultural database to resolve longstanding debates about the major cultural transitions in human prehistory. Recent years have seen the growth of large cross-cultural databases that document the features and diversity of human cultures. For example, the database called Lexibank contains data on 2,500 of languages, the Database of Religious History documents hundreds of different religious beliefs and practices, and D-Place documents our means of subsistence, kinship systems and a striking array of marital, sexual, and child-rearing norms. These databases are open access and allow anyone to visualize and download data on the diversity of human cultural systems. Powerful new phylogenetic comparative methods can be applied to these databases in order to reconstruct the history of cultures and test theories about major transitions in human history. Gray, Watts and colleagues have begun to use these methods to reconstruct the ancestral history of Indo-European languages as well as test the role of Big Gods and human sacrifice in the evolution of large, complex societies. According to Watts "we're entering a new age of research in the humanities, one in which theories about the major transitions in human history are built and tested using powerful computational methods."